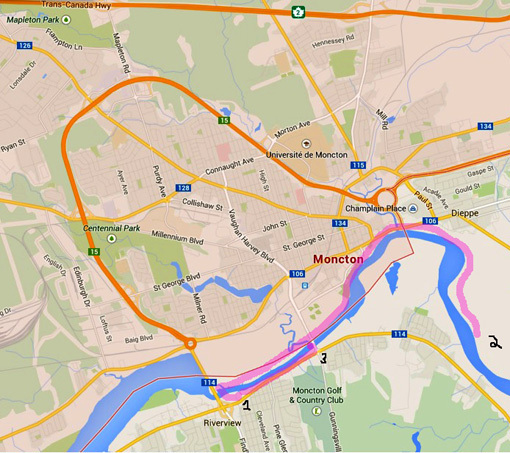 "Moncton is home to more than 2,023 acres of parkland, all within our city limits. 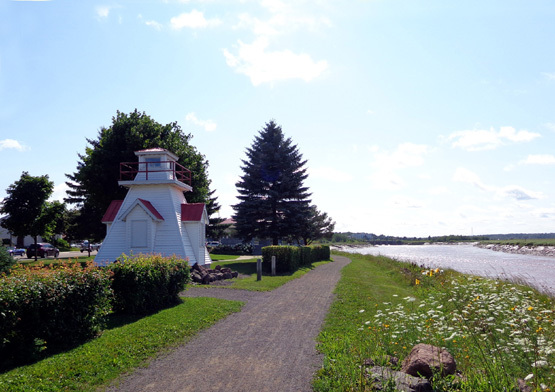 of an intricate inner tidal habitat and a dynamic network of trails and parklands." One of our important criteria for destinations where we travel is access to interesting trails to hike and multiuse paths where we can ride our bikes. 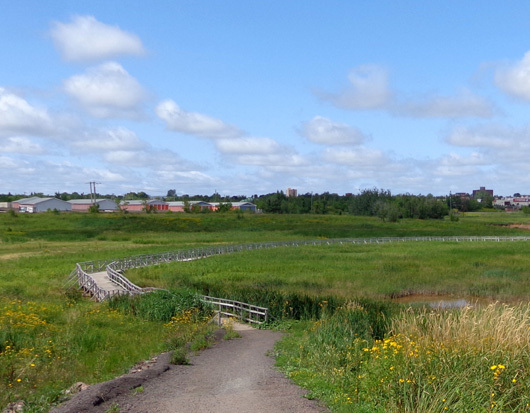 The Moncton area has both, and we went out to explore some of the options today. 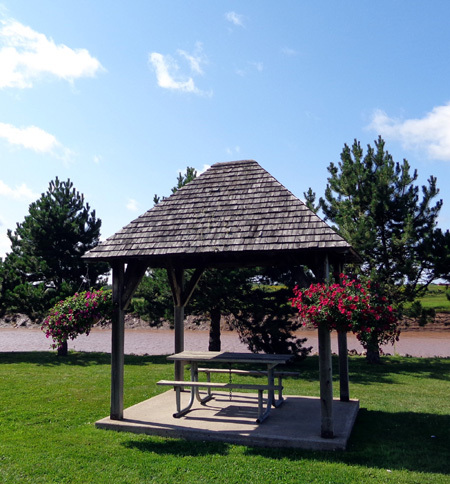 There are at least three city parks in Moncton with several miles of dirt and/or paved trails for hiking and cycling -- Riverfront, Mapleton, and Centennial. 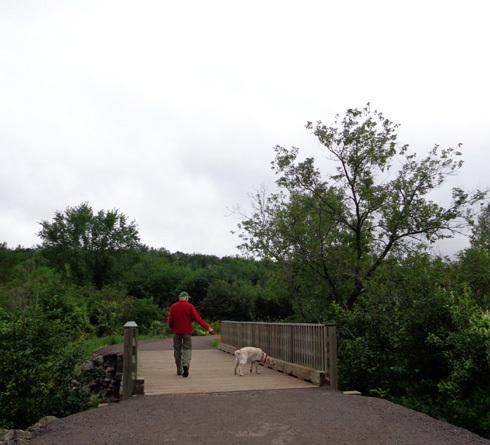 This morning we took the dogs to hike at Mapleton Park, which is near our campground in the northwestern part of the city. 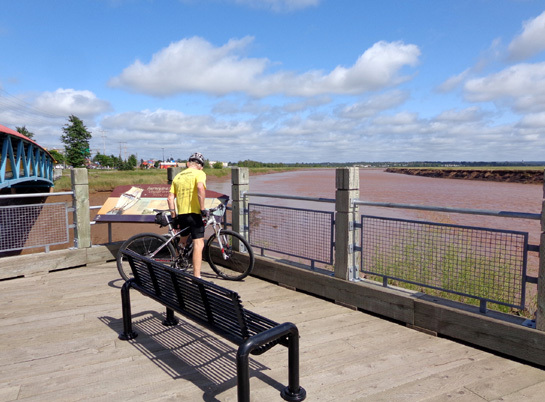 This afternoon Jim and I rode our bikes through Riverfront Park and several miles downstream along the Petitcodiac AKA "Chocolate" River on part of the TransCanada Trail. 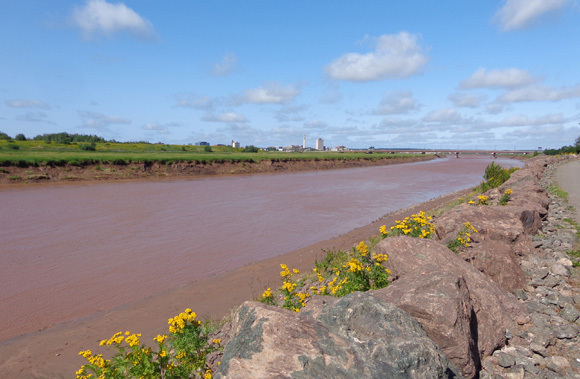 When you see photos of the river, such as the one above, it's obvious why it is nicknamed "Chocolate" -- besides being easier to pronounce than its longer French name. The water looks like melted chocolate flowing by. 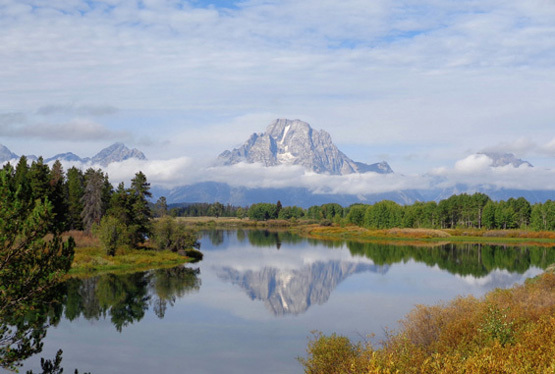 Today started off with some rain and overcast skies but turned beautifully sunny by mid-afternoon. 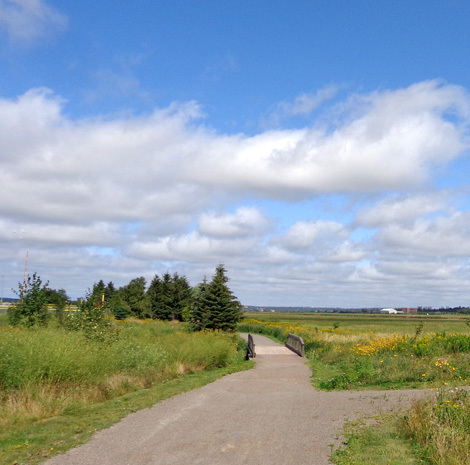 In the morning we took the dogs to Mapleton Park, which has over six miles of dirt, gravel, and grass trails for hiking and cycling. 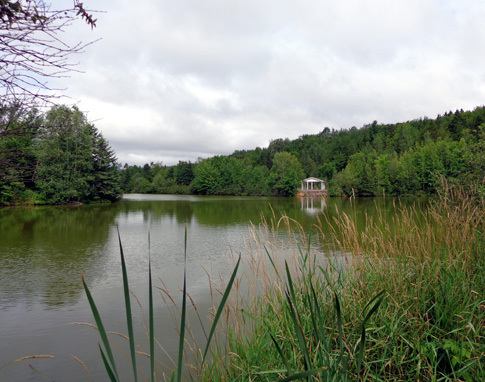 The 300-acre park, which is adjacent to a nice residential area, has a creek, two lakes, and some wetlands. We walked a couple of miles, then ran some errands before going home for lunch. 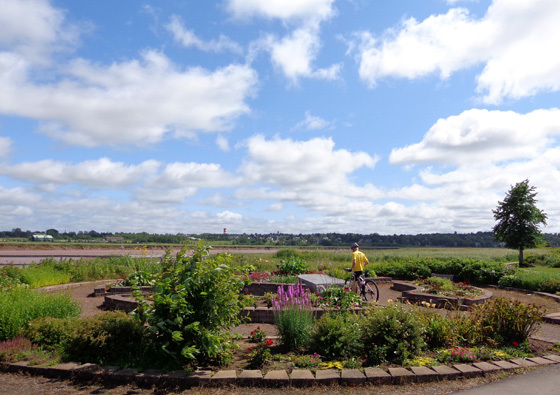 When the sky cleared up in the middle of the afternoon and fluffy white clouds replaced the gray ones, we took our bikes to Riverfront Park and rode an 11-mile "loop" on either side of the chocolate-colored Petitcodiac River. 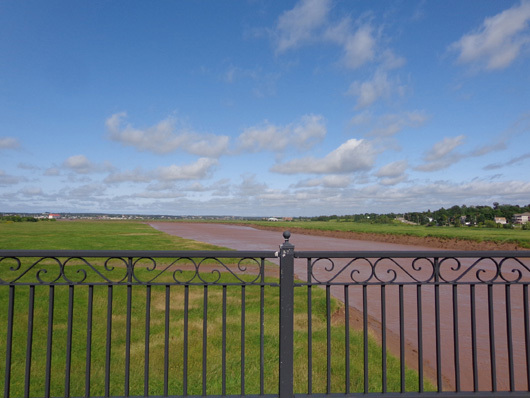 The rich brown color comes from the vast expanse of mud that is exposed during low tide and the high concentrations of suspended sediment from the huge volumes of water that flow upstream to the city twice a day. 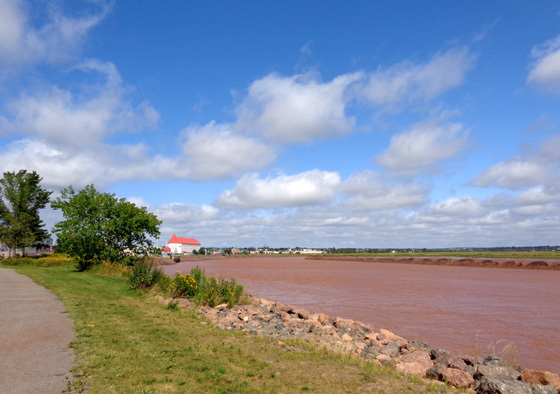 The huge tides from Fundy Bay affect the height of the river by as much as 25 feet, although not that much by the time the water reaches Moncton. When the tide comes in you can see the "bore," a phenomenon we first learned about at Turnagain Arm near Anchorage, Alaska. 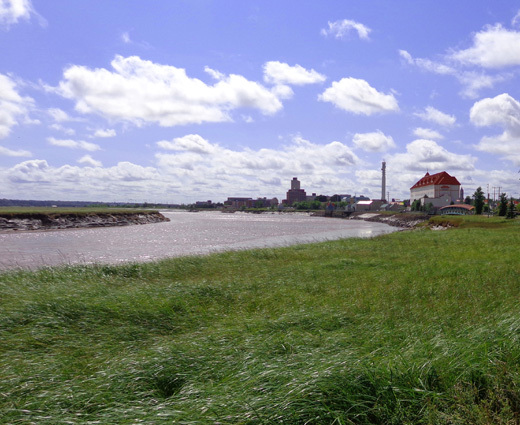 It's one low wave that spans the width of the river, moving upstream with the incoming tide. 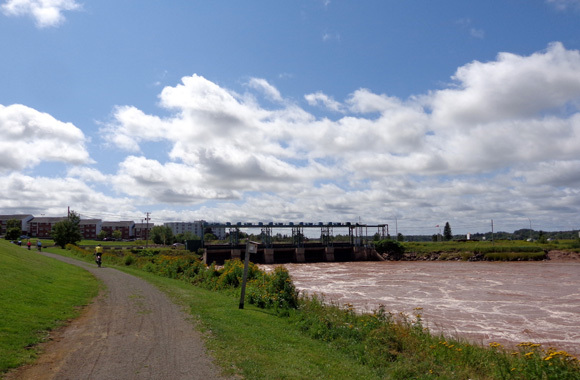 Tomorrow night during the "supermoon" there will be a super tidal bore in Moncton. Unfortunately, we won't be here to witness it. But we sure enjoyed riding along the river from about 2:30 to 4 PM today. High tide was about 6:45 PM; the river was higher than I expected when we saw it. I really enjoyed our ride. We weren't sure where to park but as we rode we saw several parking areas on both sides of the river. After crossing the river we rode uphill to one of the trailheads in Riverfront Park and headed east on dirt, crushed rock, and packed sand paths over undulating terrain. Fields and wetlands separated us from the river as we rode toward the Gunningsville Bridge. the names of Irish families who settled in this area. 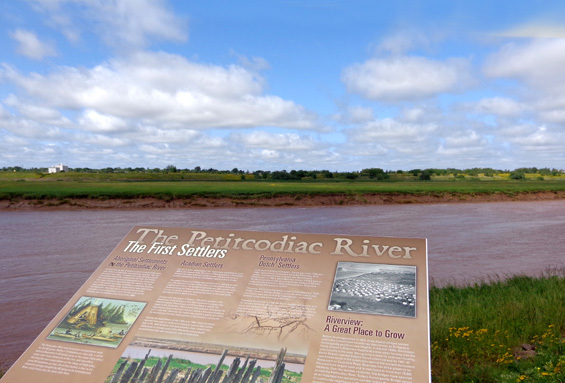 Jim reads an historical monument re: one of the battles for this territory. 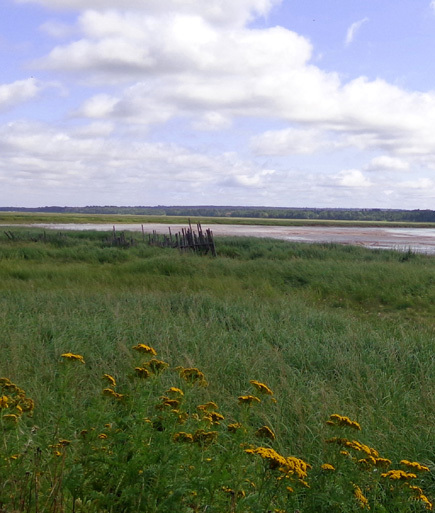 Above and below: We could see some exposed mud flats in a large curve of the river. 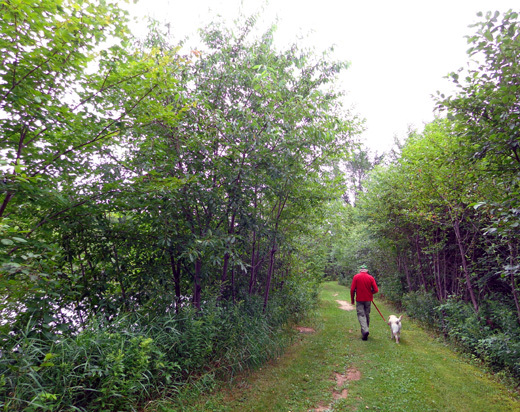 I don't know how far the trail goes on the northeast side of the river. 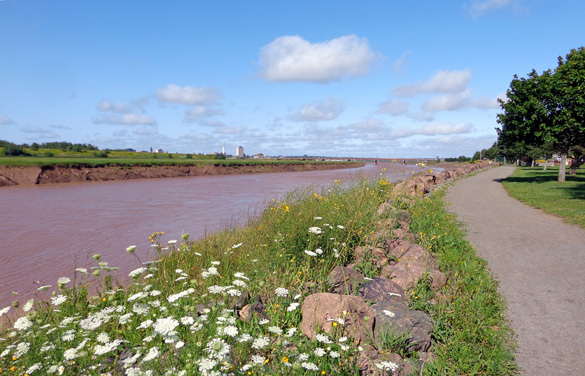 I think the section that is part of the Trans-Canada Trail is on the SW side of the river and continues inland down to Fundy National Park. 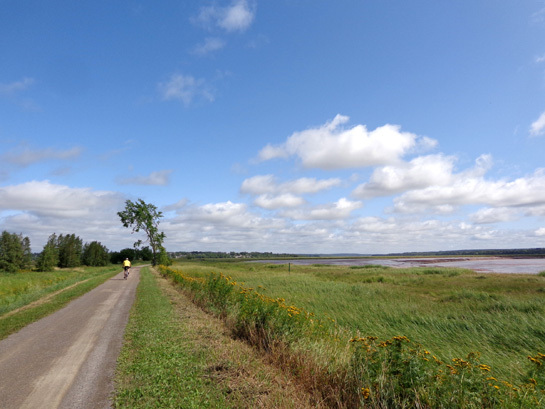 Seventeen hundred kilometers of the trail across Canada are completed out of the 24,000 km that will someday be connected. 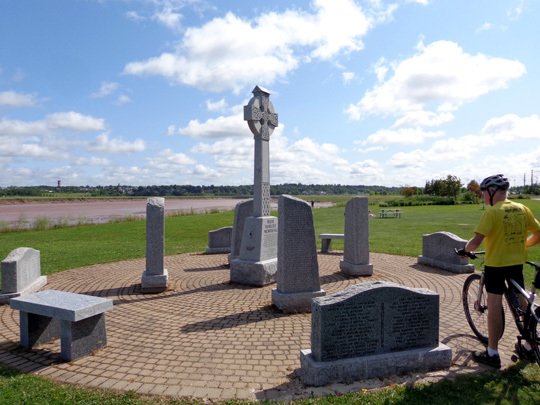 We plan to ride other parts of the Trans-Canada Trail in Nova Scotia and PEI. 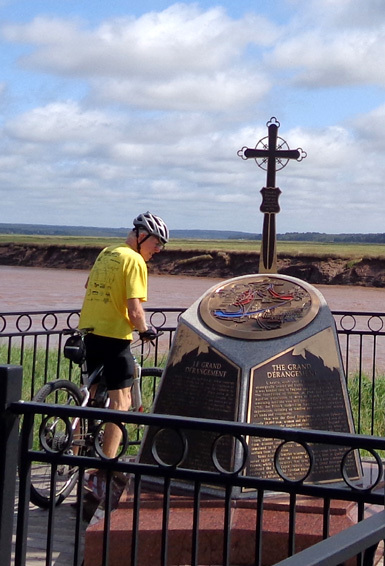 The trail is 100% completed in PEI, 60% in New Brunswick, and 42% in Nova Scotia. A couple miles SE of town we turned around and went back to the Gunningsville Bridge. After crossing the bridge we turned right on the south side of the river to complete our loop back to the truck. 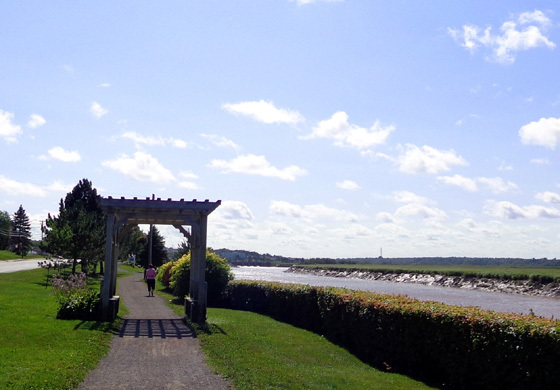 This part of the path is much closer to the water than the other side. There were lots of other trail users today -- people walking, running, and cycling. Most stayed to their right except a few who were on their left (wrong side for a bike path!). The scenery was interesting, varied, and mostly attractive. 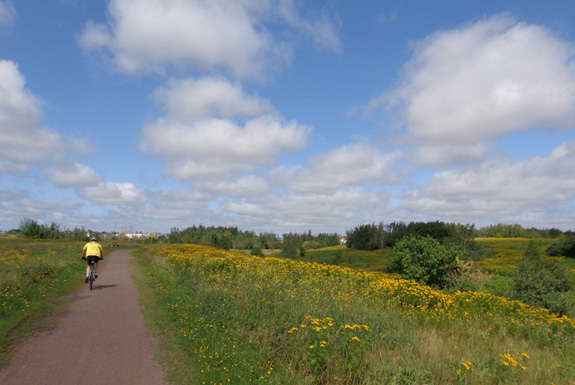 There were several beautiful flower gardens along the path and lots of wildflowers in the fields and wetlands. On the way home we stopped at Skipper Jack's to get two containers of seafood chowder to eat for lunch tomorrow. We also got more Canadian $$$ from the ATM and topped the tank with diesel ($1.349/liter CA). We're paying cash for everything we can up here, which is new for us. It's fun to use the cool see-through Canadian paper money ($5 is the lowest denomination) and loony ($1) and toony ($2) coins. Canada has nickel, dime, and quarter coins, too, but no pennies. Change is rounded up or down and, as one cashier said, "It all evens out." It's also nice to know we're actually paying less in "our" money than the Canadian prices we see. 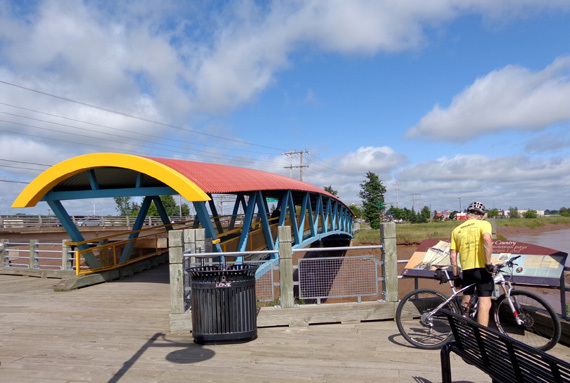 That's it for Moncton, for now. 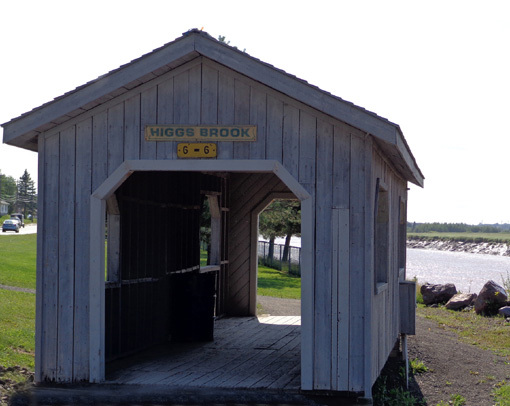 Tomorrow we're on our way to Cape Breton Island, the most northerly part of Nova Scotia. 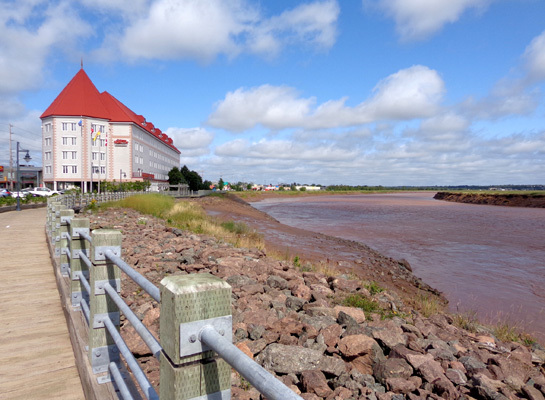 We may spend more time in New Brunswick on our way back to the States in a few weeks.